Optical fiber provides a cost-effective solution for long cable runs in L-Band systems. The QuestTels L-Band over Fiber Optics System Transmitter and Receiver allows signals to be carried from an RF Satellite signals to a Satellite Receiver with minimal signal degradation. 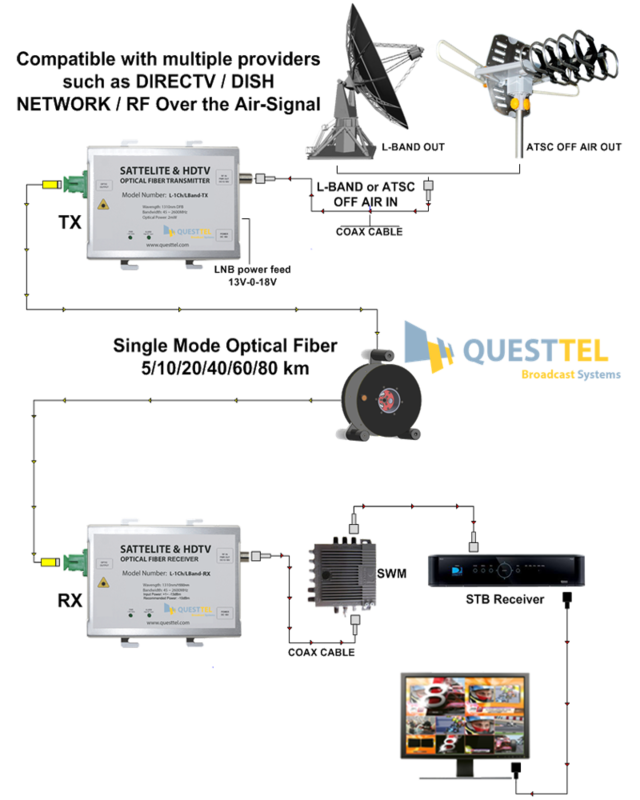 QuestTel's Satellite L-Band optical fiber Transmitter/Receiver kit offers high pefromance and cost effective alternative to conventional coaxial systems. The L-Band Transmitter and Receiver pair is used for transporting L-Band RF over fiber from the satellite antenna (dish) to the satellite receiver. 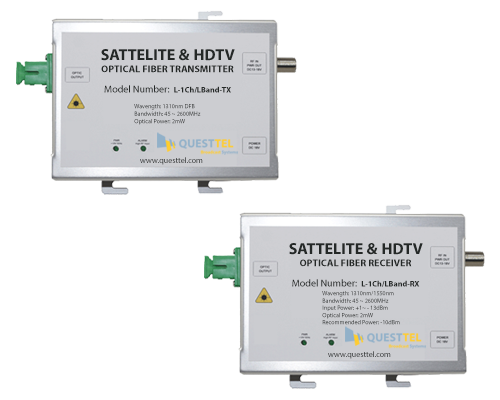 QuestTel's Satellite L-Band optical fiber Transmitter/Receiver set offers high performance and cost effective alternative to conventional coaxial systems, moreover it supports many popular content provides such as DirecTV® or Dish® Network. The L-Band Transmitter and Receiver pair is used for transporting L-Band RF over fiber from the antenna to the satellite receiver. Additionally transmitter provides optional 13/18V LNB power as well as Automatic Gain Control (AGC) to manage RF input level. By using the L-Band RF fiber transmitting range can be extended from several hundred feet to over 10 miles (Optional 20, 40, 80 and 120km declared before order). L-1Ch-L-Band-TX/RX allows satellite dishes to be installed out of view or in more suitable locations. Satellite L-Band fiber links are also useful for distribution systems in large Buildings, Stadiums or Hotels. Since optical signal is not affected by electromagnetic field, the quality of your signal will always stay at the high level. Also this fiber solution is more cost effective than coaxial system, as well as more reliable and flexible. All things considered, L-1Ch-L-Band-TX/RX offers lower cost for more capacity: provides great performance and ensures high quality of the signal, making your system more robust and versatile. Unit comes in light and compact metal enclosure, which protects internal components and adds mobility to the system. The laser is made from high quality materials, which improve the quality of the signal and prolong life of laser diode.